In this book a multi-disciplinary team of experts from around the world studies the environmental challenge posed by China’s phenomenal economic growth. An exploration of the environmental challenge posed by China’s phenomenal economic growth. Written by a multi-disciplinary team of experts from around the world. Argues that China’s development poses the greatest ever challenge for the modern world in terms of speed, size and resource scarcity. Discusses issues such as cleaner production, green car technology, resettlement resulting from dam building, and biotechnology. Moves beyond the dichotomy between alarmist, radical views and moderate notions of incremental change. Peter Ho is Professor of International Development Studies at the Faculty of Spatial Sciences and Director of the Centre for Development Studies of the University of Groningen, The Netherlands. He is the author of Institutions in Transition (2005) and the editor of Developmental Dilemmas (2005). Eduard B. Vermeer was formerly Senior Lecturer at Leiden University, The Netherlands. He is a member of the editorial boards of the Asia Pacific Business Review and China Information. Together with Jacob Eyferth, Peter Ho and Eduard B. Vermeer have also co-edited Rural Development in Transitional China (2004). Part 1. From Developmental to Environmental Policies. 1. 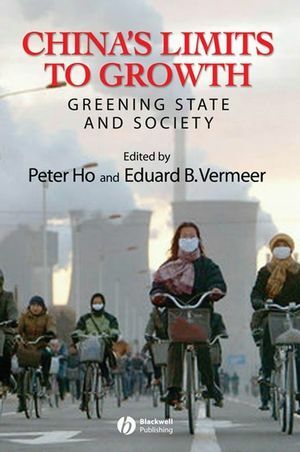 Trajectories for Greening in China: Theory and Practice: Peter Ho (Groningen University, NL). 2. Environment and Modernity in Transitional China: Frontiers of Ecological Modernization: Arthur P. J. Mol (Wageningen University, NL). 3. Implementation of Chinese Environmental Law: Regular Enforcement and Political Campaigns: Benjamin van Rooij (Leiden University, NL). Part 2. The ‘Technological Fix’: Greening Industry and Business. 4. Effects of Economic and Environmental Reform on the Diffusion of Cleaner Coal Technology in China: Stephanie B. Ohshita (University of San Francisco, USA) and Leonard Ortolano (Stanford University, USA). 5. Implementing Cleaner Production Programmes in Changzhou and Nantong, Jiangsu Province: Hongyan He Oliver (Harvard University, USA) and Leonard Ortolano (Stanford University, USA). 6. Whither the Car? China’s Automobile Industry and Cleaner Vehicle Technologies: Jimin Zhao (University of Michigan, USA). 7. Environmental Reform, Technology Policy, and Transboundary Pollution in Hong Kong: Richard Welford, Peter Hills and Jacqueline Lam (all at University of Hong Kong). Part 3. Environmental Frictions? Dams, Agriculture and Biotechnology. 8. Resettlement Programmes and Environmental Capacity in the Three Gorges Dam Project: Gørild Heggelund (Fridtjof Nansen Institute, Norway). 9. A Market Road to Sustainable Agriculture? Ecological Agriculture, Green Food and Organic Agriculture in China: Richard Sanders (University of Northampton, UK). 10. Biotech and Food Safety in China: Consumers’ Acceptance or Resistance? : Peter Ho (Groningen University, NL), Eduard B. Vermeer (Leiden University, NL) and Jennifer H. Zhao (Wageningen University, NL). 11. China’s Limits to Growth? The Difference between Absolute, Relative and Precautionary Limits: Peter Ho (Groningen University, NL) and Eduard Vermeer (Leiden University, NL).